Houston Astros starting pitcher Dallas Keuchel during the 2018 ALCS against the Boston Red Sox. UPDATE [5:10 p.m.] — One of the sluggers recently linked to the Phillies is officially off the board, as the Cardinals have acquired All-Star first baseman Paul Goldschmidt from the Diamondbacks, the clubs announced Wednesday evening. Jon Heyman was first to report the Cards had landed Goldschmidt. The Phillies may have missed out on lefty starter Patrick Corbin, who signed a six-year deal with the Nationals on Tuesday, but that was Tuesday. Today is a whole new day with a whole new round of Phillies trade rumors to follow as Matt Klentak and Co. look to bolster their pitching while they also try to target the two biggest-name free agents out there, Bryce Harper and Manny Machado. And just hours after Corbin signed with the Nets, a pair of pretty big names have already emerged as legitimate backup plans in the Phillies search for left-handed pitching. First, there's four-time All Star Madison Bumgarner. According to Jon Morosi, the Phillies and Brewers are making a push to get a deal done with the Giants. "I think the Phillies are the most likely situation of all. I think the Brewers are some distance after that and then I think staying in San Francisco is probably third on that list." - @jonmorosi on the Madison Bumgarner trade rumors. Manny Machado or Bryce Harper: Which is a better fit for Phillies? Bumgarner has spent his entire 10-year career with the Giants, winning three World Series titles and a World Series MVP (2014), and has never posted an ERA above 3.37 for a full season. And while that's incredibly impressive, there are two downsides to going with MadBum. First, the 29-year-old starter has seen his numbers — and his number of starts — decline in recent years as he's struggled to stay healthy at times. Second, he's going to cost more than money, as he's still under contract with the Giants for another season at $12 million. Still, having someone with his level of postseason experience on a young, unseasoned staff could pay dividends as the Phillies will be looking to make their first trip to the playoffs since 2011. Then, there's 2015 American League Cy Young Award winner Dallas Keuchel. 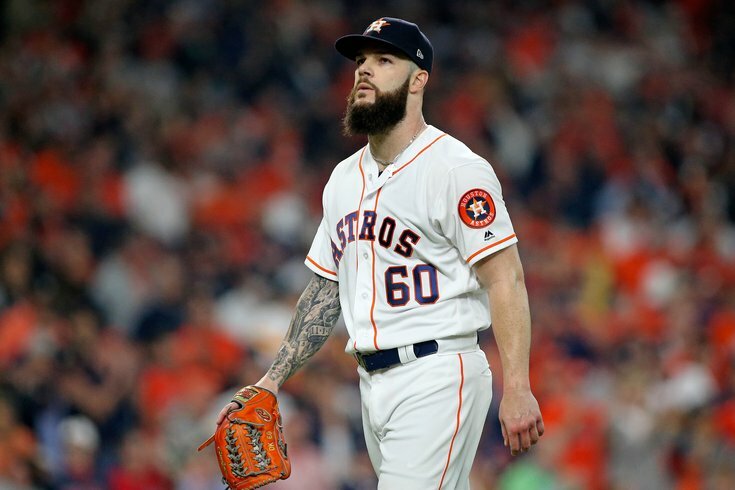 According to a post about Keuchel in MLB Trade Rumors, Boras called Keuchel the “soft-contact genius of his era.” Because of this, the team that signs him will need to have a strong infield defense to contain the nearly 27% soft-contact rate that Keuchel does so well. In a league dominated by home runs, Keuchel has given up relatively few, especially when compared to other starting pitchers. In 2017, the year of the home run, he only gave up 15 in 145.2 innings pitched. In 2018, when he pitched 204.2 innings, he gave up 18. Compare that to 28 in 2018 given up by former teammate Justin Verlander and the 32 given up by Mike Fiers in 2017 – Keuchel’s ground-ball rate seems like a real asset. Of course, with numbers like that, the Phillies won't be the only suitor. They'll also have to compete against the Yankees — the other team who missed out on Corbin — as well as several others, like the Blue Jays, who have already been linked to Keuchel. We'll have you covered as news develops, but in the meantime, here's a look at the latest rumors and reports surrounding the Phillies (and the rest of MLB, for that matter).